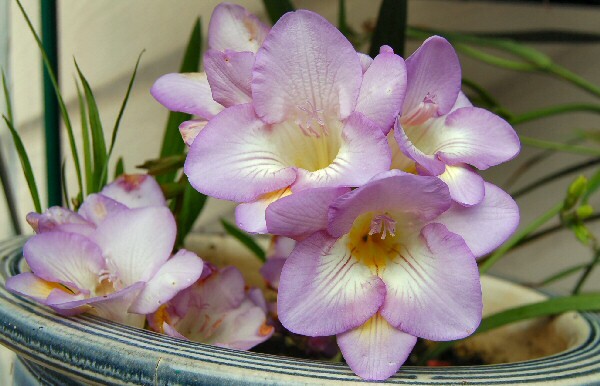 Can you believe my freesia is still blooming? Good morning and happy December! Last night I held my dog close in the warm, fluffy blankets, fully realizing that he is getting older. The window was cracked open and the cold wind lightly breezed in the window. I snuggled yet deeper into a soft sleep, with my precious dogs head up against mine. I hugged him closer and closer, trying to stop time. Ah... what would I ever do, without my best friend? Hey! Stan Fagerstrom's part two column is up and always a good read. Click here! Francis Caldwell has an excellent article on trailer care. For that, click here. Too funny!- I finally hooked a salmon, yesterday! Bill and I went out. I wasn't particularly fishing for salmon. I was trying to find a steelhead in that perfect, glacial looking water. I used some secret bait to tip my jig, too! Bill makes fun of my trial and error approach to fishing. I'm not afraid to try odd things, with all kinds of lures and lipsticks! I have all these bottles and bags of fun things to play with, so why not? I certainly couldn't do any worse, this year! Frankly, I've surprised Bill more than once! He flatly refuses to try my lipstick, even though there are days I outfish him, hooking salmon after salmon on some odd new tackle. With my lipstick, I finally reached over and kissed him. Not knowing that he was now wearing the magic on his lips, he caught a fish! (Finally!) I tease him about that, to this day! These maggots are lime colored and by golly, they perfectly matched the color of the fluffy Chartreuse & Green Marabou First Bite jig I'd chosen! A girl has to match her colors, right? So... I was fishing in this deep hole below a riffle, out back. When I fly fish this area for trout, I cast out into the riffles and then let it drift deep into the hole and swirl around a bit. That's what I did, yesterday. The very first cast in this hole, and FISH ON! It was huge, too! I couldn't move it off the bottom! Bill was fishing right next to me. There is nothing I like more than to be silent about it - not say a thing, and just reel it in. However, this fish just didn't feel solid to me. I was worried it would come unpinned. So, I began to laugh, and yelled at Bill, "...and don't make fun of my maggots, Bill!" He looked over. My rod was bent in half and just at that exact time, the fish breeched the water and flipped over in mighty splash, throwing my hook. Bill continued to fish with frozen prawns. Well, I am worried about the storm, still. Sustained winds to 60? Oh, my! I'm supposed to drive Roo to the doc in Portland Monday morning. Somehow, I think I kind of doubt that will happen! I spent yesterday trying to set up the cam, so I know what I'm doing for the Sportsman Show. It's not easy! Port routing is not my favorite thing and this program requires it. Anyhow, if you want to watch along, the bird cam for now, is here. It's not streaming, but it may be, if I can figure it out. It won't be a constant here at ifish unless people really enjoy it. But, it's fun for a project while I'm recovering. If it was live, you'd see chickadee, towhee, sparrows, junco, and the infamous who eat all my suet-bluejay! Yesterday, as I was walking along the river, I got the most spooked feeling. The river is just absent of activity. It's haunting. The eagle isn't soaring, looking for food. The seagulls are rare. Only two or three, here and there rather than entire flocks, cleaning the river beaches. There are very few dead salmon on the bottom of the river, and I have yet to find a salmon redd. The river is full and ripe and ready. It is well into winter. The seasonal nest is ready. It's like the calm before the storm, but the storm of returning salmon never arrives. I just sustain this empty feeling, waiting for the sounds, the smells, the sights of new life and death; the turnover, the creation of a new generation of salmonids. I sure hope it's happening elsewhere, because the Kilchis river is empty. The table is set, and no one is coming to the party. It's quiet, and the song the river sings this winter is unfamiliar and spooky to me. I stand on the river bank and stare into the water and wait and wait and wait. Finally, my eyes water and I'm not sure if they are tears or fatigue, but I shiver, and move on, into the house feeling unfulfilled. This feeling urges me on to do something. Maybe we need this odd year. Maybe it will push us to actually do something about it. Maybe all of the sports groups will come together to the aid of the salmon. I just don't know. I have seen periods, seasons... where the river feels silent and without life, but if you look closely, you see that life is everywhere! The river is often very private with it's creation. A safe, soft, silent cradle for life. But, this year, this year... it's different. I hear it's cry. That same feeling of the 'calm before the storm' exists outside my window, today. But, I know; I can feel it. I know that this storm will come, and it will arrive in all of it's fury. There is no way that the air outside could remain still and go through the changes it must to greet the arrival of this coming warm front. It's got to be violent. The stillness and darkness outside my window is the earth's way to prepare for battle. So maybe... just maybe the people will finally come together and greet the coming storm front of a battle for salmon, also. Maybe the empty rivers are the battlefield and the fighting and bickering between sportsfishermen are the clash before change. Maybe it's got to be violent and ugly in order to get something done. I am touched by your thoughts and your heart. I believe you are richly blessed with many who love you and depend upon you. Your courage, clarity and openness is a breath of fresh air. I know it is frustrating to you to hear soo much negative thoughts, however, you are the lightning rod. Sometimes it seems that people are saying the same thing, yet, reacting to "phrases and words" out of context. It does show, however, how much love their is for the "heart" of fishing. It is good that passions are high. The thing we must pray for that all will unite with each other and stop bickering about feelings. As an older man I wished sometimes there was an anti testosterone treatment, maybe they all just need to get a little older and wiser. Maybe we need to start treating each other as we want to be treated. The article in the paper was good and bad. Bad that a few phrases igniting animosity and misunderstanding. Good that it shows that many people are approaching the problems and so many care. Nothing is going to happen without pain. A child is not born without pain. A good name comes at great cost. Also this battle will come with pain. The question is whether we will be willing to pay the price. My thought is this. Feel great because you are tempering many extreme feelings. You are appreciated and loved for who you are. I don't know you, yet, my heart beats and my tears fall in concert with every painful, sad and frustrating hardship you are willing to share. It is good to be in the presence of honesty. Thank you for just being you. For being willing to share your journey on this earth. You are making a huge footprint in the hearts of so many people. I am sure you are the breath of life to all those close to you. May God bless our land. May God bless our words and thoughts. May we have courage to fight this battle with integrity. May God bless you and yours richly. Maybe some of these warriors need to take a day do their nails and wax their legs. lol Give them something to complain about anyway. lol "just kidding"
Isn't that beautiful writing? I was going to snip some out of it, to show you the part about everything happening with pain, for it was part of my point in writing, today and has been in my mind. But, the whole thing has lifted my heart to read it again, today, so here it stays. I put these special notes and letters into a folder to read when I'm feeling down. They are my stocks, my secret bank account, and I draw from it when my reserves are low. Well, I've rambled and covered enough subjects this morning to flood a river. The barometer is falling. I can feel it. A storm is coming. Although I worry about this one a bit, I still think I need it, to clear my head. If only the storm would bring with it the health and the life of our rivers. Me too, Joan! -but I do worry about my beautiful cherry tree! Get ready to rock and roll! Last night you'd think the storm had already started. But, no! It's to get worse than this! Way worse! We have a cat door in one of the windows and the rubber flap was slappin' time to the storm. It kept me up all night. I slept on the loft. It's my "storm suite". I love sleeping there as the rain is so close on the roof. It's soothing. The fireplace is right off to the side, and it's just a neat little "fort". But sleep? I had very little of that! I rose at 3 to see if I could close the slappin' cat door, but the cat was nowhere to be found, and I certainly didn't want to leave poor Molly the fishing cat out in the weather! So, Kilchis and I climbed back up the stairs. I got into bed, held the covers up and Kilchis climbed in with me. Brrr! It was still really cold out, but Kilchis snuggled up and kept me warm. I just love that! At 5, the wind finally forced me up. I couldn't stand laying there listening, any longer. I had to check the weather station, the wind gusts, the barometer! There is a storm coming that is powerful, and I also wanted to read the emergency alerts. I get them through e mail and my mailbox was full of them! But, here they are, online! See all of the red text? Yep! All four of them, currently! The most I've seen is five, I think. Anyhow, it's a wild start to December. I'm going to go to the store to buy a battery backup for my computer. It would be tragic if I lost the contents of this hard drive, now! I haven't backed up, lately! Yikes! I'm going to leave the cam up for as long as I can, this morning. It's fun to watch the field and the trees sway! I'm almost tempted to drive to Portland today, as Andrew has a Dr. appointment in PDX tomorrow. I'd rather be there! Oh- By the way-- Andrew (KJ) is new to driving. Actually, he got his license way back when he was 16, but hasn't driven much until lately. He has taken over David's car while David is at college. He's thrilled with his ability to drive, and is doing fairly well. However, I really worry about him with his eyesight. But, no need, I guess! I worry, but he is confident! So confident that I found out that he's driven to Portland, and to Warrenton without my knowledge! I'm almost glad he didn't tell me! He told me after the fact. Funny thing is that he drove at night! Wow! I'm proud of him! Now I'm not so worried about that "first time to Portland!" He said he did really well. I'm such a worry wart that I probably would have said "no" had he asked ahead of time! He's twenty years old. More than enough years behind him to be on his own! Time to let go, and let God take care of him. Don't you think? Well, batten down the hatches and wish us luck! Hurricane force winds are driving towards the coast! (Oh, and by the way, they finally referred to it as hurricane forced winds in the "forecast discussion." Let's name the storm! I think I'll start a thread on that! Sometimes I wonder if the salmon know these storms are coming, and perhaps... perhaps? They are staying out in the ocean until it passes? Maybe they knew, way back at the start of the season? :) I don't think so, but who knows? What is having power like? I miss my bathtub, so, so much! I'm at the Shilo right now, and their connection is painfully slow, but it's connection, nonetheless! I had a lukewarm shower, here. That was so nice! I guess they had too many taking showers at the same time. What I wouldn't do for scalding hot water on my bones! I rented a room to do some necessities. Do some laundry, make two thermos' of coffee to take home, and to take a shower. Also, to update this! What a mess. Do I have stories to tell! It's the most like one of those devastation movies that I have ever lived through. I had to drive through a tunnel of trees wrapped like a lighted wreath with power lines to get here. Scary! The top of a broken power pole with all the electrical works lay in the middle of the road. No one wants to touch that! Driving on downed power lines is scary, but everyone is doing it, to get out and get what we need at the store. Bill is out trying to find a generator that will handle how much electricity our necessities need. We have a 4000, but it's not doing the job. Plus, we think our well pump burned out! We have no water, and even though we have a generator, it's not pumping. Poor Bill. He's ready to push the house into the river. He's worked so hard to get everything working, and it seems everything is at the mercy of Murphy. Schucks got 16 generators in and within an hour, they were gone, so Bill is waiting in line at a store where they have four coming in. Good luck, Bill! My eye seems infected, and I really need to get to the doc. That's our next battle. Yeah-- I'm tired, and things seem pretty bleak right now. I think I'll try to write a more "up" update, tomorrow. I know! I know! We are hanging in there! Thank God that we all have each other! That's the important thing... right? I need to remember that! Kim-- your house looks good, but I don't know how much water it got in it if it did. It looks OK, though! And God bless the mods who uphold ifish in times of crisis! Please, thank a moderator, today! 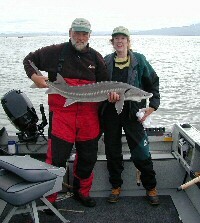 Dennis Stewart helped me get this fine sturgeon! Isn't he handsome? Both the fish and Dennis! Finally. Power! Water! Heat!!! I've never been so thankful! So, I sit down to the computer, but it never ends. My battery powered mouse is dead and needs recharging! For those that think it's hard to quit smoking, try to quit turning on lights! This is a challenge! Goes to show what creatures of habit we are. We knew fully well that we didn't have electricity, but still, often and always, we'd reach for the light switch, over and over! Our thinking went whacko, too. Trying to solve problems, we'd think, "Well, we can't use the coffee maker, but I could use the microwave to heat the water, and...!" Nope! The opposite is true, also. Once our power was restored, our water still didn't work because we blew a capacitor. Bill wanted to do some dishes, so he took some river water and put it on the wood stove to heat. "Bill? We have electricity, now. We can use the stove to heat water!" Doh! The whole ordeal was very frustrating. But, we were comfortable. People have been so kind and offered us so many things! But, we are fine! Please... if you can help, help the folks in Vernonia, or even around here there is so much damage! It's just amazing. But, people checked on people. We had so many wonderful people stop by. One morning, when things were opening up a bit and folks could travel, both Tim Juarez and David Johnson stopped by to see if they could offer any help. Wow! I love this community! The first night was rather novel. We went to the store to get some food that day. I told Bill that if we were to be without power, we were going to be prepared. I had him buy a roast chicken, some ham for sandwiches, and other necessities. (Batteries, etc.) Wow. As I try to recall, it's all a blur. The first night I'm not sure what we had, but we saved the chicken in case there was a second night. Boy, was there! But, I was creative, and cooked scalloped potatoes, heated up the chicken and made corn on the woodstove. The potatoes were so good! But, man did they stick to the pan, cooked on a burner! I still don't think we have that pan cleaned! Bill kept driving up the road on the third day, to see if we could get out. After the first storm, there were two or three trees across the road, wrapped in power lines. After the second blow, though, which was really nasty, the whole road 1/2 mile down was just a fallen forest! It was amazing. He predicted that we wouldn't get out for days. It was at that point that we all began biting at each other! I felt like I wanted to be alone, but no matter where I went, I drew a crowd. :) If I went upstairs to read, pretty soon Andrew and Bill joined me. If I went downstairs to the table, guess who followed? Two dogs and two men! It was funny, now that I look back at it. I am so lucky! When the power initially flickered off, my computer gave off this terrible zap! Then, the power came back on and my computer said it was repairing itself. Right in the middle of that, the power went off again. It did this I don't know how many times... right as it was trying to recover files! I finally just turned it off, against the computer's recommendations! Thank God it works! I'm a few days back and I lost some cookies, but that's all. The neighbors have a wonderful fishing hole at the corner of the property. I should say "had". It was this beautiful rocky slope down to the river, with old growth trees sprinkled on top. All of those old growth are now in the water, where the fish lay. I guess that's good for the fish, but I just feel awful for the neighbors. It's ruined for fishing! I think I have a picture of what it was like. I used to stand on our river bank and gaze over there, because it was so beautiful. Now, it's pretty ugly. You just can't replace old growth. Our generator is a 4000. The electrician who helped us to set it up didn't realize that our well is huge and takes way more than 4000 to get started. So, we lived without water for a week. We finally had another electrician out on the third or fourth night, and he helped us to get our freezers going, or a couple of lights. Unfortunately, the food in our freezer thawed. I don't know what on earth Bill is thinking, but because it's now refrozen, he is convinced that our food is alright. ??? Bill? It was totally thawed! I don't know what to think, though. Some of the food might be alright. Some of it didn't thaw all the way, but how do I know what to save and what to toss? Is it OK to thaw salmon, if it stays cool enough? How cool is cool enough? It's frustrating. I just hate to throw all that elk, shrimp, salmon, salmon eggs, and beef out! Three freezers full of treasures! I already threw out the contents of the inside freezer. I know for sure that was not salvageable. Bill is shopping for a new generator, today. You can bet this won't happen again! Bill is bound and determined to get it all running, after this week! I wonder how many others in this community will be doing the same! On the third day, some kind neighbor cut their way through the downed forest on the road. It was so spooky, driving through it, though. Downed power lines hung from all sides, wrapped through the trees, and sparking, here and there. The works of the top of telephone poles lay in the road as we zig zagged around them, driving to town. Andrew followed us in his car, and you could hear him laughing at the top of his lungs. I finally found out later that he was laughing at the fact that it was so like every devastation movie he has ever seen. It was, indeed! Looking back, the whole thing was just like a movie, and it's a bit difficult for me to put everything in time and place. Andrew and I ended up staying at the Shilo in Tillamook, while Bill went home to make sure the animals were taken care of. He'd come to town to take a shower in the morning, and perhaps watch a little news at night. Off I go. I'm going to do normal things, today. Take a shower, walk on the river, make some Christmas cookies. I have all of the things, the normal things to make this possible and oh, I'm thankful! I will never, ever take running water or an electrical switch for granted, again! In fact, every time I go to switch a light on, still, I think, "Does it work?" Oh! The bird cam is up, again! Oh my God! And... I mean that most sincerely! I have been floating around this morning! You know, I always joke that in order to have a relationship with my Heavenly Father, I have to have Him write huge Hiway billboards for me. That's a quiet way to tell you that perhaps my faith is not always at its strongest. Well, this morning, he did! This morning I gave a donation of a 50 dollar bill to a young Mother of two children that fared worse than we, through the storm. It wasn't easy. I really needed it. Finances are not good at ifish this time of year and I wasn't able to pay myself at all this month. But, she needed it more than I needed it, so I gave it to her, with pride. Five minutes later... I kid you not, five minutes later!! !- I walked into the Bay City post office and opened my post office box. A non addressed letter lay sideways in the small slot, and I slid it out, puzzled. Who is this from? I don't get much mail this time of year, as Christmas cards come to my home address. "You Bring Joy To So Many. When Asked Why God Chose Me For These Challenges, The Answer Was Because You Are Strong And Will Show Others How To Believe. I stood there, shaking, as a 50 dollar bill slid out from between the folded paper and floated to the floor at my feet. I don't think I've ever felt the presence of God so fully. Now, that's almost spooky! I just had to call my sister Teri, and report the latest 'God sighting'! She cried, of course. Said she couldn't wait to report it to her bible study group. I don't know, but if that's not a bill board message along the hiway, I don't know what is! I am just so behind and so broke and so, so not ready for Christmas! Yesterday after my eye appointment, I was just too tired and too stressed to face a mall full of shoppers, so I just went home. I was able to pick up a stranger on the way. My son, David! That was nice, and now he's sleeping in his room, just like the good old days. However, the peace of being home on the river didn't quite make up for the chaos in my life, and the lack of presents checked off, so I was home and grouchy! Andrew had a friend over to do their Holiday baking, and I'm afraid I wasn't a very good host. Kevin, please, please! Accept my apologies! It was a long day, and I just wanted peace. Instead, I had a kitchen full of wild young men. They made a lasagna, a Beef Wellington and a killer cheesecake, despite my grouchies! This isn't the way Christmas should be! How do I turn my frown upside down? I can't find the Christmas Spirit! My Christmas lights aren't up! I have no tree! This just isn't the way the Holiday should be! The garbage man will be here soon, and I've still not thrown out all of the damaged freezer contents. I have to do that, before he comes. That will be heart breaking. To add to it, Ifish is in debt! This is just not a good time to get folks to pay their bills. I guess the same is true for ifish, as for others! Yikes! Everyone can't pay our bills! Not a good combo! One more piece of bad news, and I'll share the good. Yesterday at my eye appointment, I found out the back of my eye is seriously swollen. My vision is well... blind in that eye. They gave me some drops, and man do they sting! Four times a day, I have to put them in. Ouch! I hope that it gets better! OK, now for the good! Yesterday when I got home, I was greeted by two wiggly and extremely happy dogs! After I got settled, I took them to the river. I fished a bit with a jig, but didn't have any luck. After, I went up to where the fish spawn in low water years. They usually don't stop there on high water years, such as this one, but guess what? I had my annual close encounter with a salmon, yesterday! I lay down my rod to wade out to explore this one new area. It's amazing how the river changes. I don't know how one would make it down from the park, as the river pushes you to one side, now, and there are sweeper trees that will get you. Scary! Anyhow, not seeing any trace of salmon, I was about to my knees, and all of the sudden, SALMON! EVERYWHERE! Whoo hooo! I stood still and sure enough, this huge and beautiful chinook hen rubbed against my boot! I love that! I stood there, still, just giggling clear down to my soul. Pretty soon, four or five beat up old men (bucks) followed in her wake. The hen was bright and shiny. If someone would hook her, you'd think she was fresh. But, no! Quietly I backed up, not wanting to be walking anywhere near her nest. Yikes! Just as I did, she turned on her side and flashed me. She was throwing eggs, right there! She was so determined that I didn't even bother her! I was only two feet from shore, too! It was just magical, being so close! I'm going down there again today, just to watch. Going to pack a lunch and just watch. I just adore this time of the year, even more than fishing! I can watch this kind of thing, forever and never get bored! Might this be why I'm broke? My aunt used to say, "When you are overdrawn, go out to lunch!" I say, "When you are overdrawn, go watch the salmon spawn!" What absolutely driven creatures, these are! OK, it is 12 days before Christmas, and I MUST order Christmas Presents over the internet, today. Yikes. I hope they get here in time! Mothers cannot fail at Christmas time! They must have the best presents that people will ooh and ahh over, forever. It's the law! It's Friday, and "That's hot!" Who am I to know what's hot? I haven't been on the board and I certainly haven't fished! Well, I fish out back, but I haven't been in a boat for ages! I do have secret ways of knowing, though, so what I do know, I will share! I'm on my way back to Portland today to get that shopping done. Man, oh man, but this is a chore, this year! Yesterday I got my ifish work done and thought I'd do some online shopping. Sat down with a cuppa coffee, and wham! The internet went down! LOL If it's not one thing, it's three others! OK, onto what's hot! The 2008 run forecast is in! If this is not the most important "hot" item, I don't know what is. Bill Monroe not only included the complete PDF, but an article link at Oregonlive. So, enjoy! Be in the know! Sure is nice to have Bill on ifish keeping us updated first! I feel so honored to have him as part of our fishing community. The bird cam is up, today! OK, I found this and just had to link it. It made me giggle. Thanks to the mystery author! Back to what's really hot! How bout a world record salmon contest! Let's guess how many cans of salmon this produced and how many Chester Gausta has left! Oh! Look at this! A Fishmas Poem for Christmas! The sponsors of ifish are having a great time listing specials and stocking stuffers! Mark Anderson of First Bite Jigs finally got his DVD in and it's awesome! This is a must have! It's also a great Christmas present for your fisherman! This is very important. River hazards, since the flood. Be prepared! Oh, and here is a Christmas poem that Stan Fagerstrom sent in! I guess I'm being silly. I'll stop! Fishing is slow! One more day to get in on the steelhead spinner swap! Hurry up! Have you seen the trailcams on the hunting board? I found out that with 85,000 plus views, this is one of the most 'hit' page on the forum! Wow! Andyk of the fly fishing forum has begun the steelhead challenge contest, and you may enter. Andyk's an awesome guy and very dedicated to fly fishing. Join them! What is your favorite steelhead fly? And as always, it's a good time (if not too late!) to look at winterizing your boats! Oh, and one last- On the bass board, they are talking the biggest fish of 07. It's fun to take a gander. If you have one to add, do it! OK, I'm trying my very hardest to get back into the spirit and have fun, this weekend. It's Christmas Tree time, and off to Portland! Have a great weekend! Ho ho ho! ps: I ask of you one thing. Please write to Marie and tell her that you miss her reports on the board! I sure do! Maybe if we get enough people telling her, she'll start up, again! :) Tee hee! And Sh! Don't tell her I sent you! She's my special sister, and I love her so much! I'm in Portland and will be home, soon! I'm catching up on work stuff and on Christmas stuff. (It's going to be a VISA Christmas!) I also have to go to the doc, this morning. Then- I'll be home! The Kilchis weather station is down until I get home, and I'm so bummed, cuz it won't track the wind speeds of the storm. I don't know what happened. It was working when I left! OK, off I go! I'm comin' home, Kilchis! Kilchis greeted me when I came home with the most heartwarming tail wagging you've ever seen! Rev, too! Kitty rubbed up against me, and I'm home! Home is where the burning hearth is, the candle light, the little boughs of fir, wrapped and twinkling brightly with little red lights! Home on the Kilchis river, where the river runs high, the winds blow and most of all... where the Christmas Spirit lives! Where the memory of a tiny baby was born in swaddling cloth, and has saved my soul! Joy! I have a feeling Milton Fisher would like it here, this morning. He'd feel right at home. In the air, lingers the smell of garlic and elk stewing on the stove from dinner here... just as it would have, at Milts. Did you ever have Milt's elk stew from a thermos, on the river? I did! Yum! I've forever tried to recreate it! I'll never forget walking into his home one winter steelhead day. The excitement of my first trip down the North Fork kept my car on track, winding onward on 53, even though I wasn't sure where (the heck!) I was going. Log trucks past me, going way too fast! "Look for the red mailbox." He said. Found it! Finally! The light in the sky was just coming on as I pulled in his driveway next to the construction of a greenhouse. I turned off the key. As I opened my car door, all around me, a dead silence. I had been the only noise in the forest. Now, it is what I know of as that "steelhead silence". It is that often anticipated excitement of silence as you hold the rope on a drift boat, waiting for your shuttle driver before a wonderful day on the river! You know that silence! I know you do! I had been listening to Christmas Carols on the way over, and "Silent Night" was playing. Dead winter cold, with humidity in the air that freezes your hands. Sunlight that drifts through the trees, fog on the water that blocks your view! Steelhead mornings after a silent night in the forest are my dreams come true. I was barely able, tripping my way up to knock on his door in the dark. I was dressed in my new blue neoprenes. I had never worn anything like it, before! He hollered for me to come in, but did not greet me. I had to search a dimly lit room to find someone. Finally! There was Milton, sitting in the glow of candlelight at his fly tying table, tying up some last minute flies. They were sure to attract the biggest, the brightest of all fishes! In the hearth, smoldering coals let of a warmth, from last night's fire. I had never met Milton before, but ever since that morning, that is an image that comes up, whenever I hear his name, or whenever I get up in the morning and light my own 'steelhead morning' candle before the sun comes up in the winter. It's my 'Milton candle', no matter which one, if it's lit in the morning on a winter's day. It's good luck for me, to light a candle before fishing. My Christmas Tree is lit this morning. I have my Milton candle gently burning. Perfect recipe! But- The winds are blowing, the rivers are... blown! But, you know... otherwise, and if I didn't know better, it could be a steelhead day come true! Regardless, it's nice to think of Milton and our friendship. We had so much fun, together! I'll never forget drinking two glasses of wine after fishing, giggling too much, and piling in his neighbor's car on Milton's lap. We were going to visit and see his neighbor's wonderful home. I didn't know either of them well, then, but we seemed instant friends. It was easy, free, fun time. No awkward moments. On days like this when the wind blew, or the rain blew out the rivers, like now, I might get a call from Milton to say that his friends were over, cooking. Would I like to join? I'd trade him a bottle of red for some smoked salmon for my family. Milton was full of good will towards all men (and women!). Ah, memories... Milton? Jim? I think of you both, during this season of steelhead and Christmas! Both of you add to the warmth and the depth of my life, during the Holidays. but, I still can't figure out or justify in my mind, why you were taken so soon, and before your time. Candles mean more to me because of both of you. Loretta used to burn one in the dining room window, and we could see it, as we rounded the last corner on the NF Nehalem, before the house. That meant hot tomato soup and sandwiches, as soon as we pulled the boat out. Our lucky catch of steelhead sloshed in the bottom of the raft. I can still feel the chill of my feet, soaking wet and freezing cold! Up, past the smoker which might be already going from yesterday's trip! Up the hill, past Loretta's greenhouse, and into the garage. We were almost there! A sign reminding me to 'grab a load of wood' on your way in was taped to the kitchen door window. When my fingers thawed, I'd help Loretta put together her jigsaw puzzle, which was always on the table. During the trip, just knowing that the woodstove waited, (which he joked was started with a good slosh of gasoline and tar shingles) was enough to sustain me, during the last couple of casts. I can hear Jim's laugh, now. As jolly as Old St. Nick, Jim laughed with his whole body, from the center of his soul! This morning, as my candle gently burns, I'm listening to Vincent Guaraldi's "Christmas Time is here". It's all so nostalgic. I used to know and play nearly that whole album, during the Christmas Holiday parties, back when I played piano for a living. I'm full up and bursting out with memories during this season. My life has been so full, so good, so wonderful. I have few regrets. I have been truly blessed and it is truly overwhelming! I miss Milton and Jim so much! And now, Ben! Where have they all gone? "Hello?" I want to scream, as I cast out onto an empty river. Sometimes I still yell, "Ben, Ben, Ben, Ben!" When my rod goes down and I have a fish on! Oh, I miss my Mother, dearly! The years and years of memories, all of my loved ones past- They all come together at Christmas! Memories of tiny children opening presents! The joy! How can we possibly recreate that, now that we are older? As the years pass, Steelhead fishing is more and more a part of my Christmas season memories. The loss of my steelhead friends adds a sweet but sad layer of nostalgia to an already emotionally packed season full of days gone by. What helps me is things like the Christmas Toy Drive, but mostly, remembering the reason for the season. Sometimes I think I'm finally at the point where the memories warm me, rather than breaks my heart. But then... the tears fall and the river rises, again. Please be good to yourself, this season! Caution! The extreme wonder and joy of the season has a flip side! If you aren't careful, your heart will tread, there! But, this is always what saves me! Good tidings of Great Joy to all people! It's life and soul saving to me to remember that my own personal memories of the season isn't what Christmas is all about! Fear not, and focus on this! I'm having fun in the kitchen, today! I'm making my own blue cheese dressing, some individual rum cakes just like STGRule made and gave to me, (oh my gosh is it good!!! ), and then our dinner. A good, old fashioned knodel, just like my Mom's German friend used to make. Yum! With this recipe, all I know is that you take the pork sausage, (suppose to be 1# pork steak, ground, but I just buy sausage), one half or so cup rice, and sauerkraut . I lay down the kraut in a big dutch oven, make meat balls with the uncooked rice, finely chopped onion and sausage, and then layer it with more kraut, on top. Cover it with water, and put the lid on. Bake away for 2 or 3 hours, adding water as necessary. Serve it for dinner with a big helping of mashed potatoes! Oh, yum! I started this writing over three hours ago, and not only am I exhausted, but I have so much left to do! I have to finish! Yikes! Bill said, "You sure set out some lofty plans for yourself!" Uh huh! I think I can! I think I can! I think I can.. It is the night before the night before Christmas! I just realized that! Yowza! Man... I couldn't stop crying. Want to listen to something extremely touching? Be warned! Especially at Christmas, when we celebrate the birth of Jesus Christ, this sure gets to me! On a brighter note, I have been cooking for the last three days, and I'm ready to fish! Well, maybe I'll cook one more day, as I have to make the family traditional "Sweet Petals" tomorrow morning. Besides, the rivers are way blown out. Even the Kilchis! It rained today like none other! But onto the giggles, read this! We do need an ending to it, though! Or, how bout the Salty Dog Version? I must confess one thing. And this one thing is one thing that I just realized! I have a tree! I have lights! But, I forgot to decorate the Christmas Tree with our ornaments! OK, if that's ALL I forgot, I'm doing well! Merry Christmas from Molly the River Cat! Molly had us all in stitches last night, pulling at ribbons and attacking the bows. Poor Rev. She got blamed for pulling over the Christmas Tree when we first got it lit with lights, but you know what? After watching Molly last night, I wonder! Molly is always so interested in the wrappings, the lights... yep! I think Molly is now the culprit and I think she really enjoys the fact that the darn dog gets blamed for it! Bill and I woke up early this morning to help with Santa's duties. The 19 and 20 year old boys stockings are now hung by the chimney with care, knowing full well that Santa was there! Santa knows no age! Then, we sat at the kitchen table, sipping coffee brewed delightfully strong, and opened our stockings to see what Santa brought us! Santa is simply amazing! He knows exactly what I want! I got a metal spatula. One that I've wanted forever! And a calendar for next year... All the things that I want and can never find! He's so clever! Santa brought Bill all kinds of good things! And in his stocking, of all things, a chicken that lays an egg. It's the grossest toy I have ever seen! Here is one like it! Santa sure has a good sense of humor! Can you believe it? Have you heard? A white Christmas? Really? That's cool and all, but I am worried about going over the mountain! We may just stay home. I don't know for sure. I do, so much want to see my family, my sisters, and my Dad especially, before he hurries back to the land of sun in Palm Springs. Regardless, I'm going to Palm Springs to visit him, soon. I've never seen his home, and I hear that he is just loved in the neighborhood he lives in. They have a neighborhood community there and they all get together every week for meals and such. I love that! I have met some of them when our family surprised him one year for his Birthday. We rented a fancy home in Palm Springs and threw him a Birthday party! That was fun. I'm dreaming of sunshine and fun, this morning. I would so love to take the kids to some warm, sunny beach, somewhere, this year. I keep hearing my thoracic surgeons words as he read my CT scan. "If you want to travel, now is the time." One could take that in a kind of somber way, but, frankly, I think we should all live with those words in mind. One never knows when it is our time. Live, live, live while you can! Last night, as I lay in bed at about 11:00 PM, I called out into the night with the hopes that my children would hear, "Merry Christmas to all, and to all a good night!! Ho! Ho! Ho!" Bill picked up the cheer, and in the way of 'Little House on the Prairie's "Goodnight, Mary Ellen way' hollered back, "Was that Santa Claus?" You bet it was Santa Claus! Our house is full to the brim of Holiday Cheer. The house is dark, except for the lights that shine out over the meadow, and cast a softly colored glow in the living room. The candles are lit. The tree shines brightly, along with assorted other Holiday cheer. In the background, carols play. The fire gently swirls around logs in the wood stove. It is so perfect! Life is so good that sometimes at night I hug my knees tight, and with wonder, smile! I think back to the times that these very legs wouldn't work and I was frustratingly stuck in a wheel chair. I shake my head and can't believe that there was a time, three years ago at Christmas time that my family thought I wouldn't make it. I remember the terrible feeling of being so weak that I couldn't make it across the floor, let alone up to my bedroom. I am well. Christmas is here! What more? What more could anyone ask for? Here's to hoping that your travels are safe, the time with your family is blessed, and that you have a very spirit filled Christmas! Glory to God in the highest, on earth peace, good will toward fishermen. How'd you do on the test? What was your grade? It's like that, isn't it? The Christmas Holiday sometimes reminds me of the stress of college exams! That awful fright feeling of failure. Christmas should come with an adult warning: You are now responsible for your own joy! Yikes! I giggled as I read some people's overall experience on the board, "I had a very successful Christmas." Huh? Successful, eh? That's funny! It's so true, though! I measure my "Christmas success" over whether or not I made other people happy. I can relate so much to the "success" thing! I do! I get my "joy" by measuring how happy I made my family. That's a pretty hefty responsibility! It's scary! I know full well how it is to become an adult and realize that Christmas is no longer the end-all thrill that it was when you were little. I'll always remember one long drive across the snowy coastal pass to come home to the place of my childhood. I was fully expecting a stocking would be hung, with my name on it. I was 19, and finally on my own. I couldn't wait! I was so excited! I wondered what would be in it! Well, frankly, that was the year I grew up. You got it! There was no stocking hung by the chimney with care! I grew up that year, but I decided then and there that in my family, stockings full of joy would go on, forever! Their eyes.. are they critical? "Do you like it? -- Do you?" (READ: does it complete your holiday expectations?" There is always the chance that I'm doing it wrong. Maybe they should "grow up" but I just can't do it to them! I blame that on the fact that they have no Dad around to discipline them and to break Christmas for them. I'm excused! You know, I don't think that Bill's family "did up" Christmas as our family did when I was young. Bill reports getting underwear and handkerchiefs, and well? That's just not happy enough for me. I am here on earth to change Bill's Christmas, and I've had a great time doing it!! Hang on, Bill! Welcome to Christmas overload! For the umpteenth year in a row, we've decided on a financial cap this year that we all promptly ignored. Actually, I didn't do too badly, but it did make it harder! 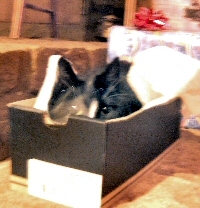 As Bill unwrapped a huge and heavy box that he'd been curious about for weeks, I carefully examined his reaction. Is it good enough? Did I pass? Is it successful? Inside the box, wrapped, and rewrapped and then padded with several foam blocks was a park bench that will go out by the pet's cemetery. This resting place for pets is tucked under the edge of the forest out by where the boats are stored. Bill has engraved several headstones for each of our passed small animals. The dogs are out back, under their own rhododendron. This grave site is for chickens, cats, and one lost-but-very loved sugar glider. And bring you home, again. It's so hard to pull off Christmas once folks are adults! As children, it's happiness overload, and forever after, we try to recapture that extreme excitement and joy! Andrew wanted a cashmere scarf so badly! They were 150 dollars, though! I couldn't do that! Imagine my glee when I found one for a fraction of that at Saturday market! Yay! He likes it! He likes it! When my kids were little, my Mom warned me, "Jennie, you are so good to your kids that they are going to think that life is one big Disneyland made just for them!" Whatdya mean? Just because I tried so hard? Just because when winter struck and the kids were bored, I went out of my way to make them happy? Once upon a time, I brought the wading pool inside the living room! Yep! I filled it with warm water, laid out beach towels, made egg salad sandwiches with a bit of sand in them, and we pretended it was summer! There will be no boredom in this house! No, sir! As if being a kid wasn't fun enough, just as it was! I was constantly trying to block out any unhappiness. Maybe part of it was that I was trying to recapture my youth at the time. Maybe it was because being an adult isn't all that fun. Maybe it was to overcompensate for Andrew's surgeries as a child. I don't know, but darnit, I like joy! Maybe we are all constantly trying to bring back that wistful, easy, wonderful feeling of being a kid. I want to recapture all of it! Days of daisy chain gum wrappers during the long, easy days of summer with nothing to do but pull blades of grass and make whistles out of them! Although there are some hard knocks and some chips knocked out of my wishes, I still sing that "I won't grow up!" song! I won't grow up, never grow up, not me! Just yesterday I was down at the river, and staring up into this one, very huge maple tree. The first thing that came to mind was, "Man, that would be a great climbing tree!" There is nothing like a good climbing tree, and if I could, I still would! I like fishing in pajamas. I like to search for agates. I like to decorate for Holidays and I search the world over for joy! I think I did good. I passed Christmas this year! It was successful! I know that, because I have peace and joy. It came from making other people happy. I think that is why, regardless of the pain that ifish sometimes brings me, that I still do it. It's my Christmas present to others, and I honest-to-God need the joy that it brings you, to satisfy myself! I do love ifish! Just as I love Christmas! But, man oh man it's stressful, sometimes! I wish it weren't so hard, but the reward is wonderful! Nothing worth doing is ever easy, is it? I hope that all ifishers "passed" Christmas this year, with tremendous joy!! And I hope you have a very Happy New Years, too! 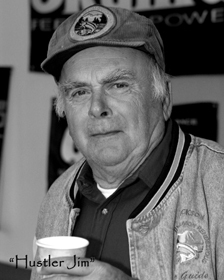 Today is one year since we lost our beloved friend, Jim Erickson. Below is the last long letter he wrote me. I adore it. I hope you enjoy reading it. I remember the last time I e-mailed you. Winter was setting in and all the trees grass and the plants were dying. To me this is a sad part of the year, and I do not look forward to it, however it is usually the start of the steel head season and the Rendezvous in Tillamook, along with elk season. Otherwise there is not much to look forward to, except the many friends that come to put their boats in to drift the river. But now spring is slowly creeping into my life. This became especially apparent drifting down the North Fork from the hatchery with my old friend Dr. Stewart, and I get to thinking, will this be the last trip this year as the river is getting so low? also, will my old friend the raft which I have had 20 years make this last trip? As we put in at the hatchery, I am greeted by another good friend the hatchery manager called Joe. I think back how many hatchery managers have seen me put in here? Thinking back it is probably been at least seven or 8. Looking around I see the remnants of the old electric weir, which was a fish killer of the highest magnitude, it is now gone; but the bitter battles I fought over this device were not forgotten, nor will they ever be forgotten, but I won. Perseverance is the key to success. Sliding the raft down the and it concrete boat RAMp put in by our steelhead chapter I wonder how long ago that was, I look for a date scratched in the concrete but it isn't there. Doc and I kiss the shuttle driver goodbye . This is very easy as the driver has been my wife for over fifty years and has done this since 1964, and as we pull out in the river, the usual ritual goes along as we tell all the handicapped people on the platform to get the hell out of the road as we are coming through. This always brings out a lot of laughs. I am very proud of the handicap platform as I fought very hard to get the funding and the permits to build this facility. This is something that all the steelhead chapters can be proud of, because without the name of the steelheaders I don't think this would have been possible. There should be more of these. Where is the cable across the river that designated the deadline? it is apparent the last big storm tore it down I will miss the bank maggots asking me to cut off the loose lines and are hanging down the river.but I am sure they will put another one up. The doc asked me how many times I have passed the big waterfalls at the hatchery hole. I have no idea but I'll bet it is close to 1000. I'd tell him there will be 28 more just like it on the way down to my place, coming into old pete meijurgens I remember all the different owners and people that had the lease on the fishing hole it started at $10 a year and ended up at $30. The doc and I talk about this...what is going to happen to this popular spot? I tell the doc there should be a fish right over in that corner and he cast over their and hooked a steelhead. Am I a magician? No, far from it, but there is usually a fish there every time I go down the river. one of my little secret spots as we drift along I see the things that were dying last fall coming back to life. There are the salmon Berry bushes with blossoms on them and a humming bird-- the first one of the year. Green leaves are starting to show up. The alders are dropping their catkins and you can see the alder groves are turning red with their pollen also the hemlock pollen we can see is drifting over the ridge tops. We now drift down to Metskers. It's a straight stretch. We looked at the big clearcut that was made about 20 years ago and see if that it is all grown up now. I have a lot of fond memories about this stretch because over the years I've probably made 25 to 30 TV shows in this area, we were never skunked. it has been good to me and the doc as we drift along I see all the slides that have formed over the years now have a lush growth of grass over them last fall they were barren. Getting down to the jack Queen King I see a large tree that blocked the left-hand side of the jack has been cut out. I wonder who did that? While sitting here pondering which way to go and old friend of mine near nine fish crack lands on the raft begging for eggs, it is a water ouzille, that has done this for many years, she is back, I see some large rocks have blocked the entrance to the left-hand slot on the Jack this is something new and will be removed this summer.in the good old days the boys and I would have taken a sack of fertilizer and a couple of sticks of powder and eliminated this problem ,but times have changed a bunch of trees at the leaning alder hole have washed out since last fall. I look around and find one of the spare anchors we hid last year is gone. We will replace it if we go down the river again this year. While sitting here a group of kayakers go by followed by a couple of pontoon boats. Coming out of the canyon I see two new houses that have been built along the river. This is usually followed by a bunch of dogs coming down barking. There used to be nobody from the hatchery down. but now? Spring is here. As we come out of the canyon I can hear the lawn mowers going on both sides of the river, whereas last fall we could hear the power saws running as the people were cutting their firewood, I love to hear the sound of lawn mower. Coming around dead man's corner we looked down the river and here is something that is really new our old house is gone and in its place is a brand-new house that looks like a dairy Queen. Loretta and I over the years have had a secret signal whereas she put a bright light in the window that I could see coming down the river. When she turned the light on, this let me know that she had seen us and we had 20 minutes to get down to the house for hot tomatoes soup and sandwiches. Would the light shine? Would she see us? p.s. This printer is working so good so I just Kept Babbling along. I miss you so so so much! The breakfasts out, when you'd come driving up and honk in front of my place in Astoria. You loved to drive in the rain! All of the fishing trips in the cold, when you made fun of me freezing out! Everything! The coffee in the morning, here, with Bill and I.
I have so many fond memories of you! A New Year's Resolution is a commitment that an individual makes to a project or a habit, often a lifestyle change that is generally interpreted as advantageous. What do I want most in the whole world? To be happy in the New Year! Simple!! My Mother taught me a long time ago that when the chips are down, we should always do something for someone else. She said that it would make me feel better. It works! Try it! Young adults are reluctant to listen to their parents, but just once... I thought I'd try it. I gave it a shot by going to play piano for a retirement home in Canby. I had just broken up with a boyfriend, and I was desperate to feel better. I had nothing to lose! Boyfriends are the world, at that age! And now, I firmly believe that I don't take Prozac when I have the blues, because I've learned that giving kindness and love is a much more effective medicine! It has a rebound effect! It bounces right back at you and fixes every malady! It worked so well that I try to make a habit out of it, now. I'd come out of playing the piano for those folks feeling like I had a feather in my cap! They were always so happy to see me! I'd walk in to see people that were sitting bored in their chairs and looking lifeless. I'd start playing and soon they'd be singing and talking and shouting out requests! I brought life and good cheer to them and I couldn't help but catch it! It's kind of a selfish thing, really, because I always felt I got so much more out of it than they did. I brought life and good cheer right back to my own life. I walked with a swing in my step all the way home! What a rush! I found a new drug! What a simple lesson, and what an awesome solution to the blues! It's really fun to experiment with. Try it! Just try it! Walk up to and say something really nice to whomever you are with today. I forget this so easily. I get caught up in my own, and other folks negatives, and I go for days without realizing that I'm sick. Negativism is a sickness. That's for sure. What's worse, is that I unknowingly spread the disease, myself, until I diagnose the illness and take the medicine. It goes the same for prayer, with me. When I forget to talk with my Heavenly Father, my life starts to go downhill. I go days and days not feeling well or happy, and then it hits me right square in the forehead! Duh! Jennie! Get a clue and fix the blue! This cure for the blues is the same as medicine, really. Since my near death experience with an aortic dissection, I have so many pills to take and yes! I forget those, too. So, the other day I felt that familiar and awful negative feeling creep into my soul. For days, I had been fitfully sleeping, waking in the morning and not wanting to get out of bed. My family began to droop and together, we were breeding some pretty darn strong negatives. We had enough for the whole community and had we have left home, I'm sure others would have caught it! But, this virus... this one is mean and nasty and it can spread through the internet, too! In fact, this very nasty virus was born after reading some darn ugly things on the internet! Pretty soon, that old negative monster grew and it grew and it grew and it grew! I was contagious, and I was spreading it further! I can cure this! And the more people that take 'the cure' the better! And so we come upon my New Year's resolution. I'm going to be a certified saleswoman for good cheer! I don't even need any training! It's so amazing how well it works. If I begin to get negative from any source... it does not matter where, it breeds and begins to multiply in my home life. And everyone knows that if Momma isn't happy, "aint" nobody happy! I just loved the Christmas story on the news a week or so ago. It seems that one person in a line-up at a coffee drive-through, in the spirit of Christmas, decided to pay for the drink for the person behind them. It caught on, and for hours people were buying the coffee for the people in line, behind! I just loved that story! The story is here and it is so heart warming! So, I hurried to the computer. I needed to get started on the cure before this awful bug invaded the whole community! I started to feverishly flip through posts and for every positive post on ifish, I stopped to email the author. I told them just how much I appreciated their positive contribution to ifish, that it meant the world to me and how much I loved their positive contributions! Yes, indeed! Almost immediately, the good cheer started to spread! Within minutes I started receiving messages that made me smile. Then, a sort of inner peace and joy swept over my soul! You know, the ifish blues happen in between seasons of good hunting/fishing. It seems to always come out, when there is a slow-down in action. Is the river too high? Did the season close early? Uh oh! Be aware! Folks start posting complaints, and the complaints breed more complaints. We can turn that around, you know! And it has to start somewhere -so if I forget, will you please remember 'the cure' and start it yourself? And remind me, too! Know that I need reminding often and especially as I get older and more feeble! Just as love is catching, so is the opposite. I have been guilty of catching that deadly and negative disease! Washing your hands just won't cut this one! I just thank GOD (and my dear Mom!) that we have a cure. We just need to remember to use it! I truly hope you'll join me in my New Year's resolution. It won't fit into my pill box, so help me to remember! Just fir starters, I have one empty slot in my pill box, which I have labeled, "good cheer". I will take it daily, and four times daily, if I need to. There is nothing really in there, but when I open it, I smile! Please, if you feel you are catching that awful negative illness, do something nice for someone else. Spread the joy and it will cure you! If you see me catching the negatives, let me know- either by being an example and sending me something nice, or flat out telling me to that I need to get out and do something that will make others happy. So many times people set unrealistic goals and New Year's resolutions, and this one is down right doable, especially if we all remind one another. Happiness, kindness, good spirits, joy... that is what our end goal in life is, right? You can't be healthy if you aren't happy! I can only imagine if each and every one of us on ifish took 'the cure' just once. We'd be so darn happy that we wouldn't know how to contain it! So, Ladies and Gents, I believe that this cure works so well that I'm willing to give you a 90 day free trial! Order in the next 15 minutes and.... No, wait! Since I benefit from you taking it, (It's a pyramid scheme, you know!) I'll give it to you for free, forever! It slices, it dices, and it really, really works!